Sweet lime recipes, Indian Mosambi recipes. Sweet lime is called Mosambi in India. Sweet limes are round citrus fruits with finely-textured skins that are, of course, yellowish-orange in color just like their pulpy flesh; the skin can vary in thickness from very thin to very thick. Sweet lime healthy juices. The sweet lime pomergranate apple juice recipe . Pomegranate juice contains antioxidants that will help to protect your blood lipids from oxidation and good for heart. Sweet lime and kiwi juice is an intelligent combination of sweet and sour fruits makes a great drink without the need for sugar! We have also added a dash of soaked garden cress seeds to the Sweet Lime and Kiwi Juice for that extra iron boost. The iron content of the seeds gets absorbed very well thanks to the vitamin C contributed by the fruits. This Strained Sweet Lime Juice or Mosambi Juice is a welcome addition to a person’s post-surgery diet, as its naturally sweet and tangy flavour helps to overcome nausea, loss of taste, and so on, which are common problems during convalescence. A peppy Mumbai street juice, the Mara Mari Juice recipe features a marvellous combination of pineapple and sweet lime juice, flavoured with black salt and spice powders. Pineapple sweet lime orange juice recipe is a combination of citrus fruits plus pineapple. This combination of tangy and sweet fruits has a tingling taste that is very refreshing. Simple, quick and easy, this sweet lime pepper salad recipe can be prepared in minutes. Capsicum is a much ignored salad vegetable that has been combined with lots of colours and flavours which perfectly complements the delicate flavour of sweet lime. Sweet Limes can be eaten as a snack-just peel and enjoy. See the benefits below of why you should have sweet lime as a snack. 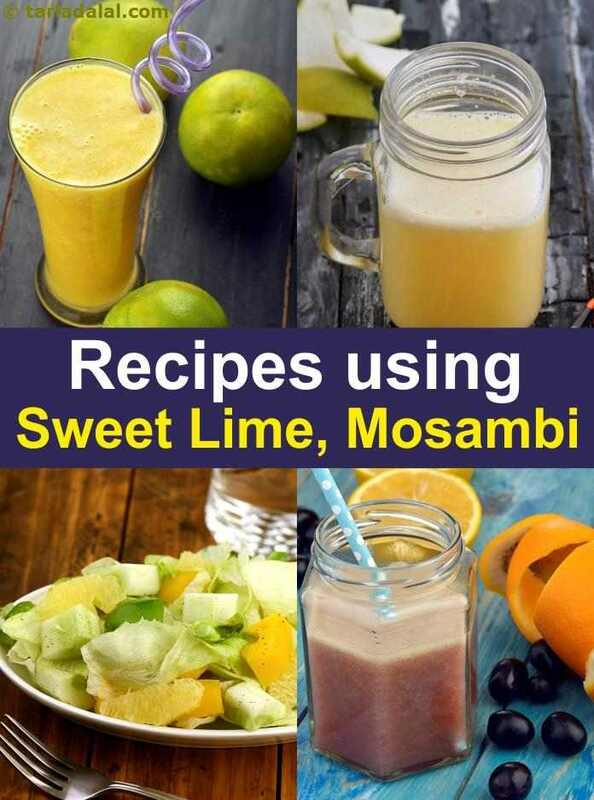 Enjoy our sweet lime recipes, Indian Mosambi recipes below. Full of flavour and colour, this crunchy salad is best to build up your immunity with its vitamin C and A rich ingredients like lettuce and capsicum.